A five-alarm fire gutted the North End Pavillion in Ocean Grove Saturday, destroying a local landmark that took nearly three years to recover after Hurricane Sandy. The fire, which officials said began under the boardwalk structure, was brought under control in the late afternoon. Fire officials briefly had it under control but it flared up, according to Monmouth County Sheriff Shaun Golden. The building is a total loss, he said. Officials are advising beachgoers to stay away from the area and the boardwalk is closed in the vicinity of the fire. No injuries were reported. Fire marshals and the Monmouth County Prosecutor’s Office are investigating the cause. Videos showed the structure fully engulfed in flames as firefighters from around Monmouth County worked for hours to quell the flames. 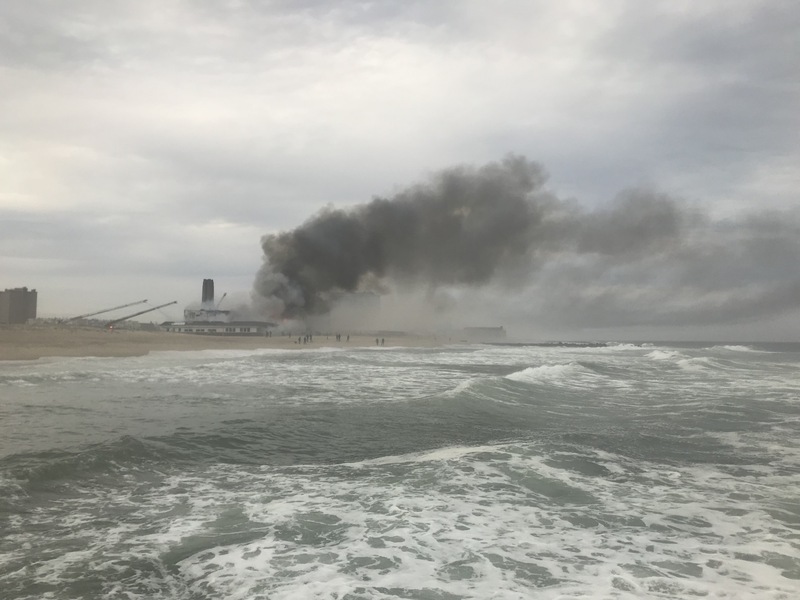 The fire was first reported around 11:30 a.m., fire officials said, but quickly spread, sending a plume of smoke creeping up the Monmouth County shore line, according to Neptune Police Capt. Michael McGhee. Mike Basile, 48, said he drove down from Long Branch to get a first-hand look. 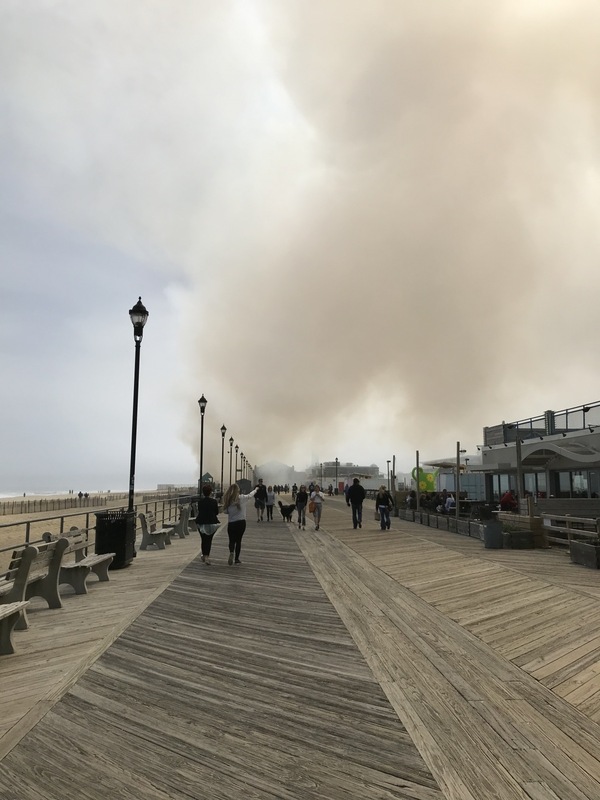 “The Long Branch beach front is just as smokey as it is in Asbury,” he said. 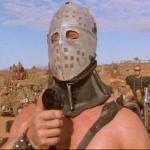 “It’s pretty thick up there, it’s traveling fast." The building houses several eateries and small businesses on the northern end of the boardwalk, south of Asbury Park. 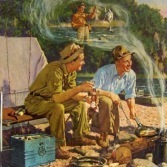 It was anchored by the Dunes Café, a food-court style setting, with about eight restaurants located inside the café including Playa Bowls, Summertime Salads and Subs and Burgers on the Board. It also housed several businesses like Jones Treasure Grove and Bettie’s Bombshells, according to the pavilion’s Facebook page. The building had not yet opened for the season. Monmouth County Sheriff Shaun Golden said it appears the fire began underneath the structure, but a cause is not yet known. The North End Pavilion has been a fixture in Ocean Grove for more than half a century. Hurricane Sandy battered the structure, sending sand and water through the building and tearing its siding bare. It took the owners nearly three years to reopen. Crystal Calandra and her friend, Jessica, said they drove down from Old Bridge to hang out in Asbury for the day and enjoy the warm weather. They arrived at about 12:30 p.m., and their plans to hang out on the boardwalk were thwarted by the massive blaze. Ocean grove is no stranger to fires nor reparations. Just two years ago, the vacant former historic Warrington Hotel nearby was destroyed by a fire. That 2017 fire came just days after the township officials had signed off to restore the hotel-turned boarding home. The fire was believed to be set by an arsonist, but a communication breakdown scuttled the investigation. When I was a kid that was the Homestead Restaurant, had quite a few Sunday dinners in there. Learned to swim in the saltwater pool, which is still there with trees growing thru it, about 75 yards west of the pavilion. Lucky that sucker went up today, after some rain, and not earlier this week with all the wind we had. I like OG, but the place is a firetrap, old wooden buildings packed in tight. Sorry Suds, sometimes my brain fails me.